Researchers from TERC monitor levels of attached algae (periphyton) growth around the lake five times per year. Periphyton is collected from submerged rocks at 9 routine sites while snorkeling and chlorophyll content measured to estimate algal biomass. An additional 40 sites are visited during the heaviest spring growth to provide more detailed information on distribution each year. Thick, green or white expanses of periphyton biomass often coat the shoreline in portions of the lake during the spring. When this material dies and breaks free, beaches can be fouled. The near shore periphyton can significantly impact on the aesthetic, beneficial use of the shore zone. 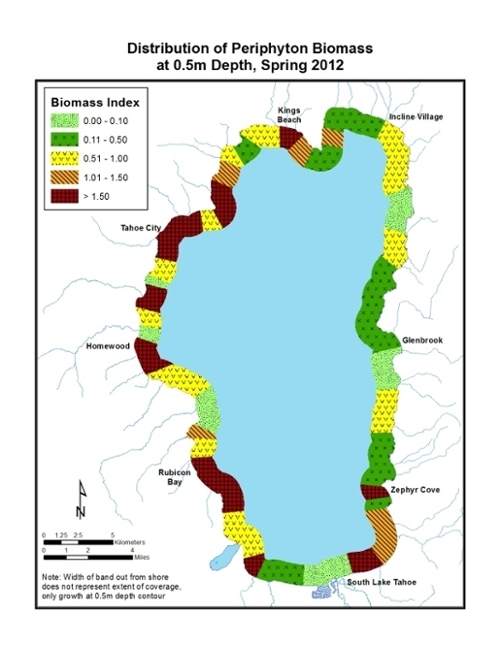 The purpose of the periphyton monitoring task is to assess the levels of near shore periphyton growth around the lake.